The presence of religion in workplaces is rising in France, with 65 percent of employees saying they’ve noticed it, according to new research. The study was published on Thursday by the Observatory for Religion in the Workplace (OFRE) and the Randstad Institute. A total of 1,405 people participated, and all religions were taken into account. “The 2016 survey by Randstad Institute and OFRE shows a significant increase of religion in business,” says Laurent Morestain, secretary general of the Randstad France group and president of the Randstad Institute for Equal Opportunities and Sustainable Development. Last year, the same survey showed 50 percent, so the jump is significant. Among those polled, 21 percent said they saw people wearing religious symbols, 18 percent said they’d heard people ask for time off work for religious reasons, and 8 percent saw people praying during breaks. “The majority of the time, these instances do not hinder work,” Lionel Honoré, director of the OFRE, told French newspaper Le Figaro. Nevertheless, religion can lead to some serious disagreements, too, the survey found – conflicts were up from 6 percent in 2014 to 9 percent this year. “Issues related to the place of religions and religious attitudes in society have become sensitive in recent years. Therefore, behaviors and situations with a direct or indirect religious dimension are more and more quickly identified,” the authors of the study said, as quoted by French media outlet Le Telegramme. 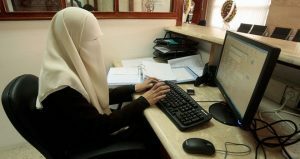 The cause of conflict in some instances was identified as men refusing to work with female bosses, with this reported in 4 percent of the cases – while 1 percent refused outright to work with someone of a different religion. Employees have also become more knowledgeable about their rights regarding religion, they added. “Employees come together to impose their prayers during work, they adapt places as prayer rooms, lobby the manager, accusing him of Islamophobia … Take it seriously because it is not a question of behavior, it is a challenge for the Republican law, and one should be very firm,” says Honoré. However, it’s important to note that religion hasn’t become taboo at work, as the research stated almost 80 percent of respondents generally know the religion of their colleagues. Also, 82 percent are not embarrassed by the topic of religion, even if discomfort is clearly increasing (18 percent against 8 percent last year). In addition, 70 percent of respondents consider religion to be a topic that occupies a significant place in relations between colleagues. The report’s findings come after the French government announced the issuance of a guide to religion, set to be published next month. In the guide, 39 specific cases of conflict will be demonstrated, with a guideline about what to do in each situation.